My husband and I were heading home from a trip early one Saturday morning when my husband spotted something in the road ahead and decided to stop and investigate. It was a small kitten around three months old that had apparently been hit by a car. He was still alive, barely and was unable to move his body and was meowing and hissing fearfully. My husband and I grabbed a towel and a cardboard box and carefully scooped him up and took him to the local animal hospital. He had to stay in the animal hospital for approximately six weeks and continued with his treatment and rehabilitation, one of the other vets felt that due to the severe head injury that Ollie had sustained he would be permanently blind. Well, after many weeks we were able to bring him home and I can proudly say he has regained most of the use of his legs with the exception of this left front leg which he keeps tucked under him most of the time (my husband says Ollie likes to use it like a kick-stand, lol). The biggest miracle of all is his eye sight, which he regained completely a couple of months after the accident. Now he chases the laser mouse toy like a pro and even with only three legs he can still give the rest of his kitty brothers a run for there money! 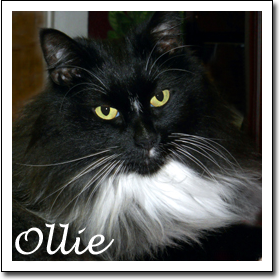 We have now had Ollie for over five years and he is definitely a joy, I can say with confidence, he is a kitty cat miracle.